An archive extraction directory traversal vulnerability has been found in WinZip for Android. When exploited, this vulnerability allows an anonymous attacker to write files to arbitrary locations within the SD card of the user's Android device. This advisory discloses an archive extraction directory traversal vulnerability in WinZip for Android. When exploited, this vulnerability allows an anonymous attacker to write files to arbitrary locations within the SD card of the user's Android device. When extacting compressed files from an archive, the extraction functionality does not properly sanitise compressed files that have directory traversal sequences in their filenames. By tricking a user to extract a specially crafted archive containing files with directory traversal sequences in their filenames, an attacker can write files to arbitrary locations within the SD card of the user's Android device, possibly overwriting the user's existing files. 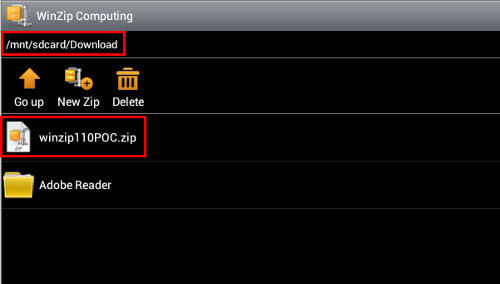 Copy the POC ZIP archive into the /mnt/sdcard/Download directory of your Android device. Extract the POC ZIP archive into the /mnt/sdcard/Download directory. i.e. tap and hold on to the POC ZIP file until the action selection pop-up appears, then select the "Unzip here" option. When the extraction completes, navigate to the /mnt/sdcard/DCIM directory. You'll notice that zipPOC.txt has been extracted into /mnt/sdcard/DCIM/zipPOC.txt instead of into /mnt/sdcard/Download/winzip110POC/zipPOC.txt. View this web-page from an Android device that has WinZip installed. Download the POC ZIP archive directly from this web-page using the Android device. After the download completes, the POC ZIP archive will be automatically opened by WinZip. Hence, by tricking a user to extract or download a specially-crafted archive, an attacker can potentially exploit this issue to write files into arbitrary locations within the SD card in the user's Android device, or to overwrite files in known locations within the SD card. 2013-06-14 - Vulnerability Details Sent to Vendor. 2013-07-09 - Asked vendor when fixed version will be released. 2013-07-10 - Vendor replied that fixed version has been released to Google Play.